Anyone who is into horse racing will be familiar with this one as it is the traditional drink of the Kentucky Derby during which some 80,000 juleps are served. 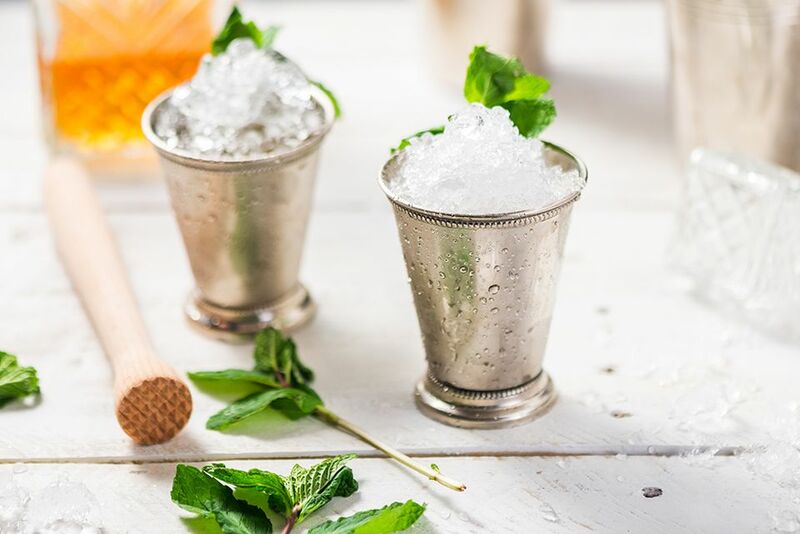 Traditionally, Mint Juleps are served in silver or pewter cups and held by the handle or rim in order for the cup to maintain optimum frost, but they work just as well in any tall glass. There are also many variations of this popular cocktail: 10 Mint Julep Recipes. Place the mint and simple syrup or sugar into a julep cup, collins glass, or double old-fashioned glass. Gently muddle your mint. You want to open up the veins of the mint leaves to release the essential oils, not tear the leaves to bits that get stuck in your teeth. Stir well. Once you have the drink built, take the time to stir it gently until the glass gets frosty. Pour your favorite bourbon. If you have a favorite brand of bourbon, use it or something similar. It is best to choose one of the higher end brands for the simple fact that bourbon is the only liquid in the julep. Though it is sweetened and flavored with sugar and mint, the whiskey is primarily what you will taste.